We often get asked what is a good mowing regimen to maintain a great looking lawn without over doing it, so we have compiled what we consider to be the top 13 lawn mowing tips and tricks to help you. In part 1 we will give you the first 6 of our top 13. Mowing seems simple enough, but every time you mow your grass you’re paving the way for the success or failure of your lawn. Mow correctly, and you’ll have turf that’s healthy, drought-tolerant and thick enough to crowd out weeds. Mow incorrectly, and your lawn will struggle to survive. Time the mowing of your lawn so you’re never removing more than one-third of the total leaf surface area with each mowing. Avoid scalping grass, which is essentially, cutting it too short. A scalped lawn is vulnerable to diseases and weeds. Scalped turf tends to be sparse and weak, which exposes soil. One of the top contributors to weed infestation success is exposed soil that allows weed seeds to take root. A sparse lawn also lets sunlight reach weed seedlings which, in turn, helps them grow. Grass that’s consistently cut too short has a poorly developed root system and that makes the lawn more susceptible to serious damage from drought or high temperatures. Keep your mower blades sharp to get the best results from each mowing. A sharp blade cuts grass cleanly but a dull blade tears grass blades, creating a jagged, uneven edge. These tears create openings for pests and diseases to the enter grass blades. 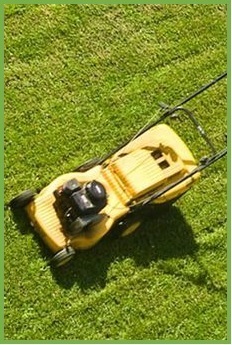 A lawn that has been cut with a dull blade can develop a brown or white hue as the tips of individual grass blades die. Sharpen your mower blades at least a few times each season. Avoid mowing over debris, exposed roots or stones that can reduce blade sharpness or even damage the blades. Adjust the mower height throughout the growing phase. Shift the cutting deck higher in summer and allow grass to grow longer. Taller grass helps shade soil, which prevents weed growth and slows water evaporation from soil. Taller grass also develops deeper roots, which creates a lawn that can withstand drought better. Mow when your grass is dry. Mowing a wet lawn doesn’t harm the grass, but it doesn’t yield the best results and wet grass fills and clogs a mower deck. It also has a tendency to fall over and clump together as you mow creating an uneven cut. Watch for clumps of wet grass that fall off the mower. Remove these from the lawn after mowing to avoid smothering/killing grass. Always avoid mowing in soggy soil, or you risk creating wheel ruts and tearing up grass. If you must mow the lawn when it’s damp, treat the underside of your mower with oil or silicone spray to help prevent grass from sticking. Also, make sure your mower blade is sharp to avoid ripping grass out of soil. And be aware that mowing wet grass presents a potential slip hazard. See our next blog post here for the remainder of our 13 lawn care tricks. For a new instant lawn just contact the team at Harden Park Lawns today.